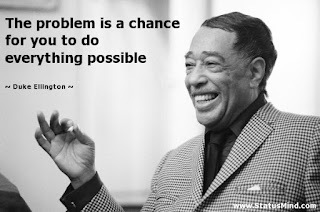 This week I wanted to share more jazz quotes to inspire us through the summer days. I've done what I've done but it's not enough. I'm a student of jazz and there's just so much more to learn. Intuition has to lead knowledge, but it can't be out there alone. The past months I have been struggling with severe depression. The bright side of this darkness is that I have learned a lot about myself and expanded as a compassionate person. In this time, I have utilized jazz albums to help me on my worst days, which I wanted to share. This is one of my favorite Coltrane albums. 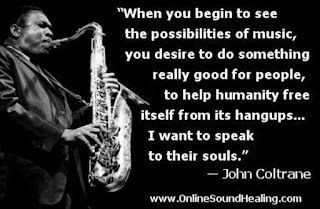 I love Coltrane for his emotional rawness and the honesty that emanates from each and every note he plays. 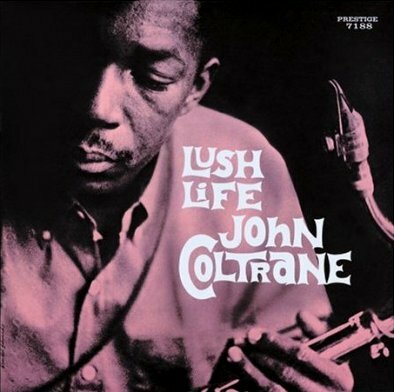 Honesty is a quality that brings me closer to Coltrane and it makes me feel as if I am not alone when I listen to him. "In a Sentimental Mood" from Duke Ellington & John Coltrane is one of my favorite jazz recordings. The track is contemplative, calm and sad. When I am feeling down, this song helps express emotions that aren't always verbally ready to come out. John Coltrane and Johnny Hartman is currently my favorite vocal album. Johnny Hartman has a deep, rich and tender voice that perfectly compliments Coltrane's lush tone. The tracks are reserved without too much improvisation, yet each track emanates with passion and love that makes this album great to listen to when you need something to express yourself. This album is one of my all time favorite albums as well. Sonny Stitt brings so much energy and charisma to each track. This album is explosively full of happiness that helps reverse a bad day and take my mind off of dwelling negative feelings. "Sunset And The Mocking Bird" from The Ellington Suites is my favorite Duke Ellington recording. The track has a searching, high spirited quality that connects me to feelings of being sentimental and longing. These feelings help me destress and pursue my day in a positive manner by expressing what I feel on the inside. When I was in the hospital, I found myself singing "I Didn't Know What Time It Was" in my head every day. The expressive, sweet tone of Charlie Parker along with the powerful, lush strings makes this album one of my favorite albums of all time as well. Songs from this album have become a chant for me to use whenever I am at my worst. "Blue in Green" from Kind of Blue is my other favorite jazz recording of all time. This song has gotten me through some of the worst times of my life. When I was in the hospital this song got me through panic attacks and moments that I felt the world was crumbling beneath me. The song shows me what is beautiful in the world, and I relate to the level of detachment and loneliness the track emotes. Even at the worst moments of my life, I have found that jazz is my saving grace. I am so grateful to have found this music that helps with any problem that comes across my path. From having severe depression, I know in my heart it will get better over time as long as I keep singing on cloudy days. And to anyone else going through similar struggles, I hope you know you are not alone. I don't try to please when I play. I try to heal. The wise musicians play what they can master. Just don't give up on trying to do what you really want to do. Where there is love and inspiration, I don't think you can go wrong. The first post on Kind of Pink and Purple was entitled Reasons Why I Love Jazz and dates back to December 29, 2013. Since that first post, I have graduated high school and I am now in my third year of college. As a teenager, I often feel alienated by my love of jazz. I live in a world of swing and bebop, yet my friends seem to be repelled by the name "jazz". Somehow without ever truly listening to it, they can hate it. You know, when I was a bit younger, I didn't listen to the radio. I felt like pop music was fake. But, by being surrounded by my friends, my peers, my generation, I can say I really can and do love pop music. Not all of it, but I can find meaning in it. Some songs really speak to me. Across all genres there are songs or artists that really speak to me. By living with it, I have come to love it. 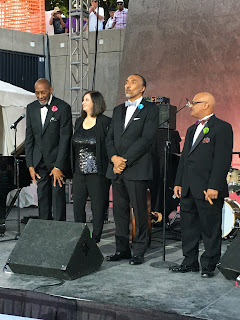 So I wanted to blog about why I love jazz, because I think people my age should try to listen to it, and try to love it. Sometimes I think that teens hate it because they have this misconstrued perception of what it is. Well, I can't truly define it, but I'll give you reasons why I can say jazz is my life, and I wouldn't want to live any other way. Now that I am twenty, and settled in college, rereading these sentences takes me back to this headspace that is a bit too negative. Do I still think everyone hates jazz? No. I feel that jazz is not adequately taught in public school education, even though it is integral to American history. I feel that jazz, when make affordable and available to the community, is in fact widely loved. 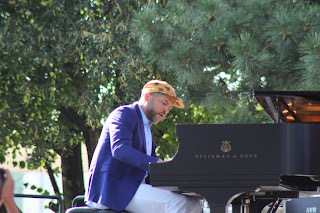 I have experienced this sense of love and community at the Detroit Jazz Festival, for example, which is the world's largest free jazz festival. 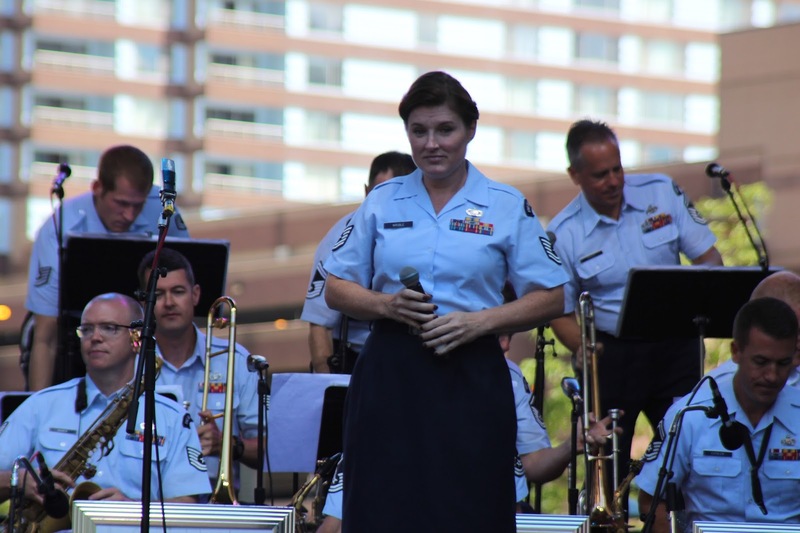 I have felt connected to jazz history through my work as the editor of JazzBoston's newsletter, where I write about Boston's immense history and interview members of the music community about festivals, venues, and more. 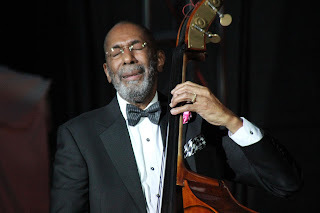 Ron Carter at the 2016 Detroit Jazz Festival. Do I still have reservations about pop music? No. As a film composer, every type of music is valid depending on the circumstances. As a musician living in America, I feel that it is disconnected to not open my ears to all types of music, people, countries, etc. I will always love classic jazz albums, and artists such as Miles Davis, but that does not take away from what else is out there to hear. 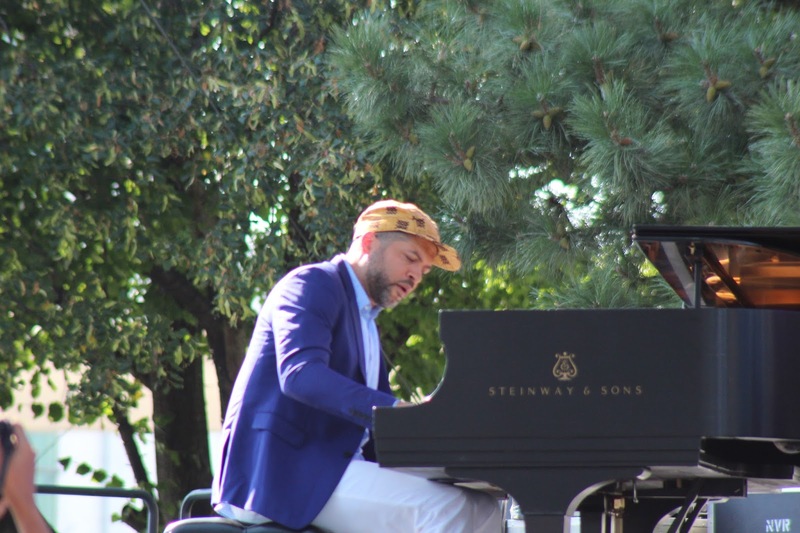 I have experienced opening my eyes and ears in such places as the Montreal Jazz Festival, which hosts international musicians and artists. Art from the Montreal Jazz Festival. Do I still feel that jazz is my life? Yes. And no. 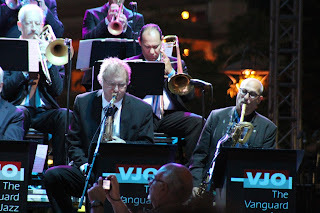 Jazz is integral to my life, and is something I work on, practice, play, listen to, compose, analyze, read about, etc. However, lately I feel that life is so much more than a genre of music. I have experienced that jazz elevates my life, but music represents all that is in the human experience. 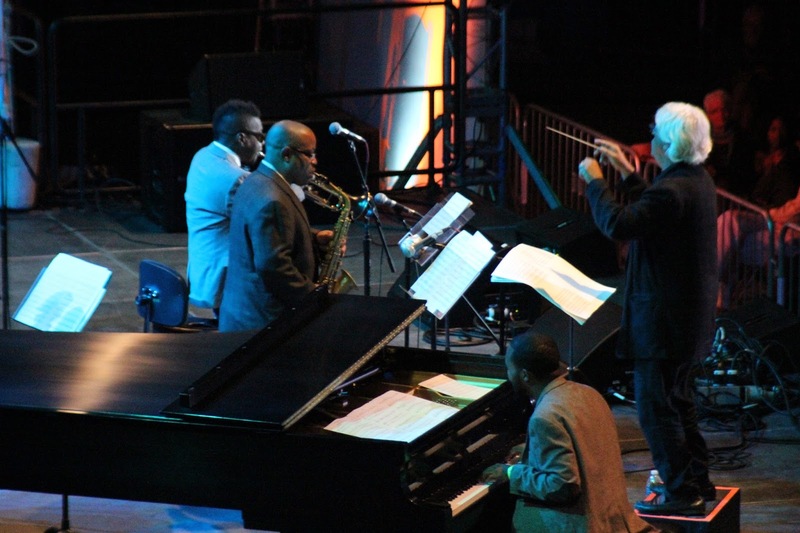 The end goal of jazz is not a goal of creating great music or art, but rather a goal of sharing perspectives on the human experience, and celebrating community. A picture from previous travels to New York City. 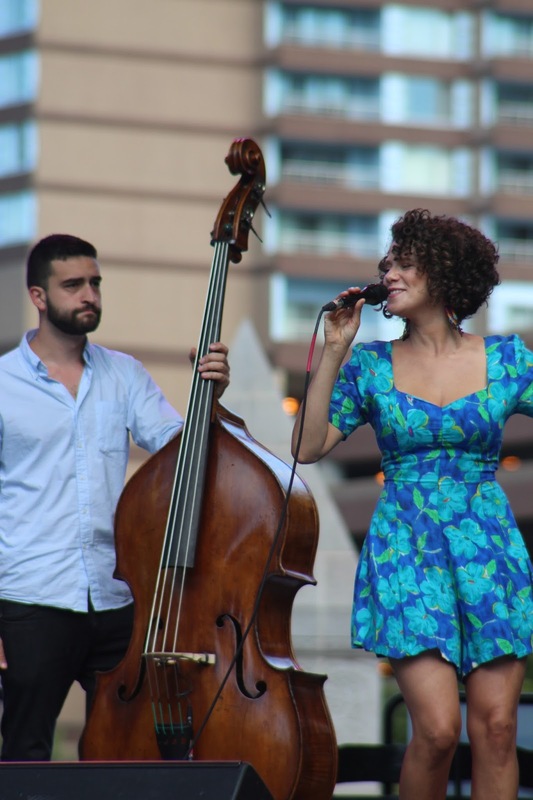 Maybe jazz won't become your life, but maybe you'll find some new music that speaks to you. And isn't that the goal of all music - to speak to you? As I continue in the path of a professional musician, I know that I am privileged to say I found something that speaks to me, that I am passionate about, that I have the utmost privilege to study. As we wrap up 2016, I wish everyone a Happy New Year, and all best for what's ahead! After writing on this platform for almost 3 years, I took a couple month hiatus from writing in order to focus on school work. However, I am happy to come back to writing in order to share some of my experiences and lessons from this semester. To preface this, I am studying saxophone performance with a duel degree in film scoring, with a minor in writing for television & new media at Berklee College of Music. In addition to lessons, I wanted to share some influential music, from both jazz and film genres. This semester at school I had the immense privilege of being selected to go on Berklee's Cultural Leadership Retreat with the Diversity and Inclusion Department. This retreat brought together a small group of Berklee students from different backgrounds to talk about social justice and ways to improve our communities. We focused on learning about oppression, identities, intersectionality, and privilege. This experience taught me to think differently, to approach scenarios in new ways, how to actively listen to someone, how to be an active bystander, how to celebrate differences and how to be inclusive to different viewpoints and backgrounds. One exercise we did was having two silent circles of people. We would rotate and look each new person in the eyes while a moderator said things such as, "see the struggles this person has been through to get here," or "see the joys of this person's life." This activity made me deeply realize that while we all came from vastly different lives, the depth and types of emotions we all feel is similar. I want to continue learning from these social justice and team building exercises, and share them with my peers whenever applicable. This semester I realized that in order to solve problems I need to be proactive about the root of the problem. For example, procrastination can come as a result of poor time management or anxiety can come as a result of not utilizing stress management techniques. The question is, how can I move forward so when I get to these points I have the skills to react calmly, to manage my time? How can I move forward in a way that can be proactive when these problems are bound to happen? In this way, planners, color coding, scheduling my time, taking breaks, setting realistic expectations, and chipping away at work over a length of time are all skills that are proactive. I want my New Year's Resolution to focus on this: to become more organized by being proactive. This semester I continued with my hobbies of studying Tai Chi and karate. Studying these martial arts is a great way to relax and learn interdisciplinary skills. While karate seems distant from music, the underlying concepts are the same and this has taught me how to "learn how to learn" again. Practicing slowly, repeating areas that you have trouble with, focusing on fundamentals, following through with movements, breathing effectively, etc. are all ideas I learn in these classes. Also, traits of respect, honor, patience, integrity, humbleness, strength are emphasized. 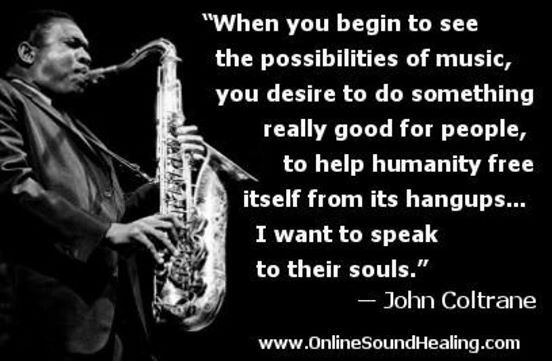 This carries into music, especially in jazz, where my saxophone teachers emphasize similar ideas: practicing scales slowly, focusing on areas I have trouble with, being humble while you assess what you need to work on. This mental focus and courage is applicable to any career path. This semester I learned to solve problems as an individual. For example, in the past I have talked about how veganism has positively changed my life: I am healthier, more compassionate towards animals, and my carbon footprint is much lower. This decision has led me to be empowered so when I see something I do not like, I can make a choice solve that problem in my own life. In addition to animal rights, I feel strongly about unfair labor, and realized that buying clothes second-hand is better for the environment than fast fashion and reduces the demand for clothes from sweat shops. I also feel strongly about elevating jazz as a musical community. Many people, musicians included, feel that jazz is an exclusive club, and this concept frustrates me as jazz is supposed to be built on a sense of community. In response to this, next semester I will be starting a club at Berklee College of Music, The Women in Jazz Collective. The club hopes to create this kind of community of diverse musicians, composers and business people in the field, as well as a space for those interested in jazz, of all levels, genders, backgrounds, etc. to learn from each other by promoting diversity. At music school students get a lot of criticisms from conflicting viewpoints and sources. I have learned to be skeptical of intentions and to focus on what will help me grow. I have learned to filter through feedback and assess what I think is true for what I want to do, as a musician and composer. This is different from completely ignoring feedback: it is consciously deciding what I think is worth my personal investment to commit to practice. For example, a rude comment from a peer can be ignored, but well-intentioned feedback from a teacher will be used to grow. This semester was especially fulfilling and challenging. I am excited for what next semester has to bring! I included film music and jazz music in this post, as film music is a huge part of my life. I hope that you can hear the intersection between jazz and film music from the selections I shared. Last weekend I attended the Detroit Jazz Festival, the world's largest free jazz festival. 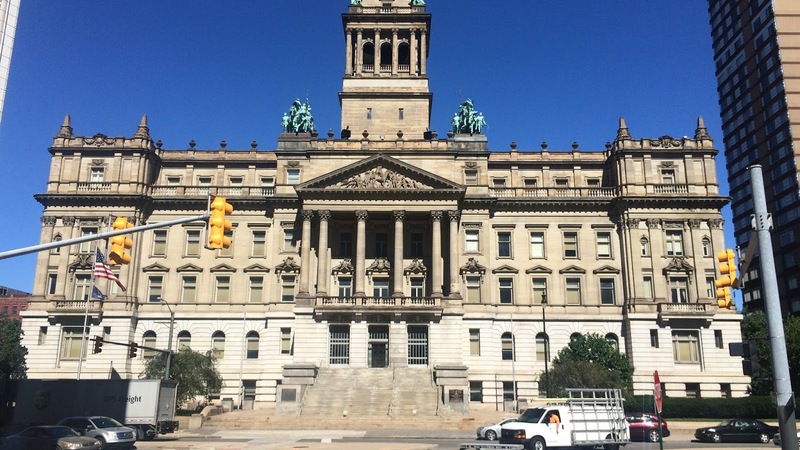 The event is held each year over Labor Day Weekend at Hart Plaza and Campus Martius Park in Detroit, Michigan and spans four days, Friday to Monday. 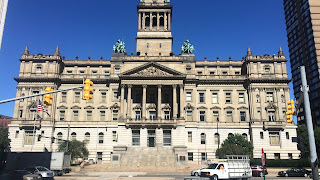 I wanted to share photo highlights from my time in Detroit in order to show the depth and beauty of the event. All photos are by Paul Burega. 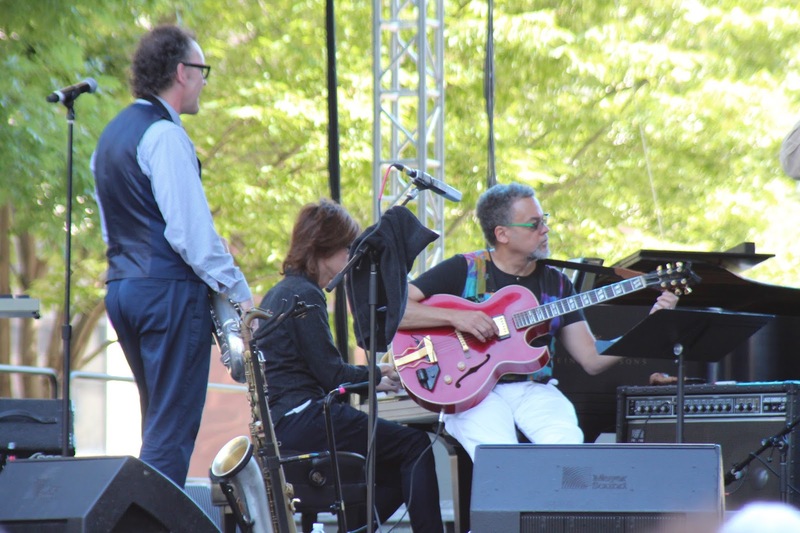 The Detroit Jazz Festival brings amazing local, national and international acts to four different stages. Local Detroit Public School students are able to perform amongst Detroit jazz professionals, Mack Avenue Record label artists, jazz legends, international talent and the Artist in Residence. This year bassist Ron Carter was the featured Artist in Residence. Carter's career has spanned over 50 years, and he has played on many of the most important jazz recordings with greats such as Miles Davis, McCoy Tyner, Herbie Hancock, Chick Corea and Wayne Shorter. In addition to this, he holds the Guinness World Record for most recorded bassist: he has appeared on more than 2,000 albums. A native of Michigan, Carter went to Cass Tech high school in Detroit, and was greeted with a heartwarming homecoming. 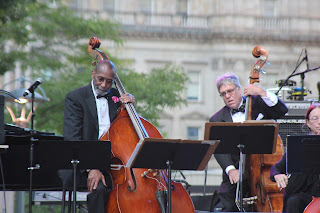 My favorite show of the festival, among many highlights, was the Ron Carter Quartet because of the energy and inspired solos from the group. The many themes of the festival included education, mentors and disciples, the artist in residence program, living legends, and beyond category groups. 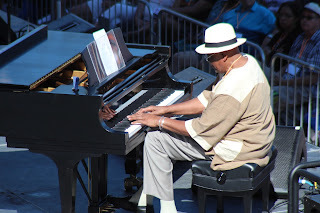 It was amazing to see the local Wayne State college jazz band have pianist Randy Weston as their special guest as part of the mentors and disciples program. Also included among the music is a Jazz Talk Tent, which hosts daily interviews with festival artists and historians. 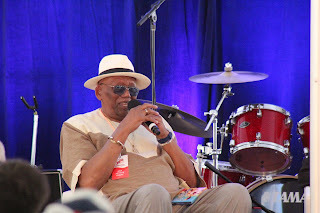 A special highlight amongst the interviews was the rare chance to hear pianist Randy Weston and saxophonist Jimmy Heath, both around ninety years old, speak about their lives. Randy Weston spoke about his time living in Morocco for some years, while Jimmy Heath spoke about his relationship with Dizzy Gillespie. 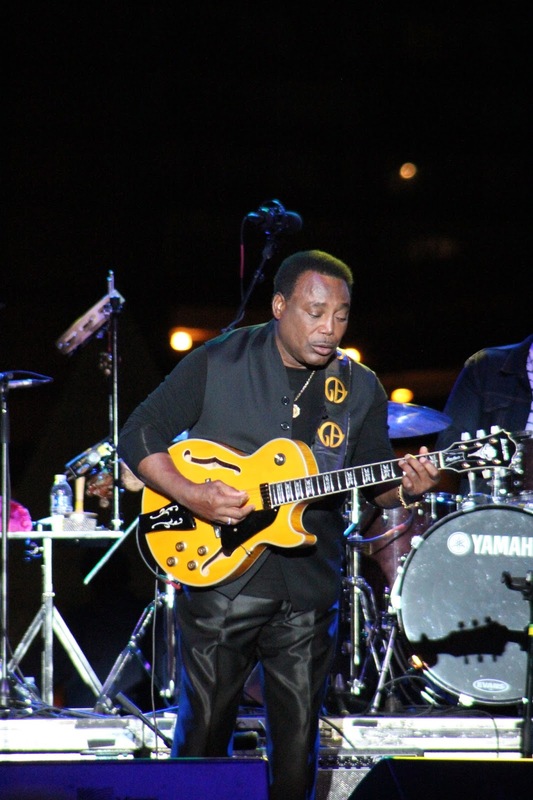 There was also numerous jams, both in the daily schedule and as a nightly jam session. At night, the jams were packed to see the house band play with many of the talented artists that came to sit in from the festival. The jam photo below is from a special collaboration between Detroit local artists and Japanese guests. In addition to this, there was a nightly movie screening that featured episodes of the Nat King Cole television show that were fully restored. Nat King Cole's brother, Freddy Cole, performed at the festival and came to the television show screening to speak about his brother. I was able to see restored episodes with Ella Fitzgerald and Sammy Davis Jr. as guests. I was amazed by the tap dancing and comedy of Sammy Davis Jr., who even mimicked Charlie Chaplin in a skit. 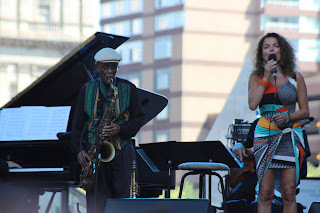 The Detroit Jazz Festival was the highlight of 2016 for me. 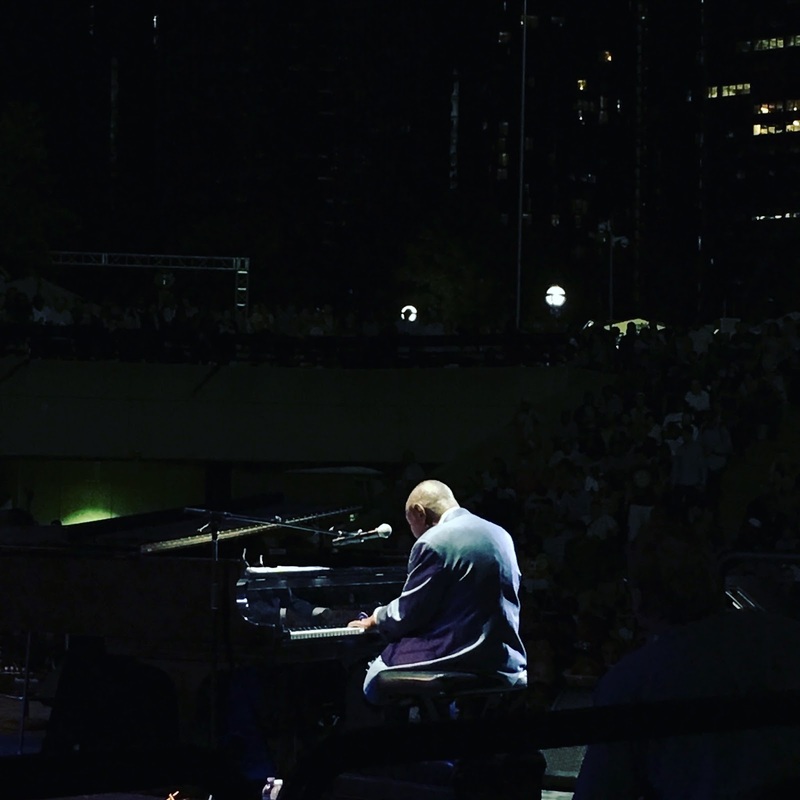 There is nothing that compares to the experience of being immersed within inspiring, jubilant music while in a city as warm and kind as Detroit. I met and talked to many wonderful people, that shared their stories with me and encouraged me to play and write about jazz. 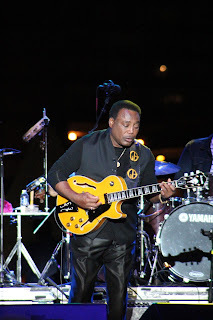 I hope these pictures showed you the color, liveliness, joy and diversity of the festival. Any of these acts could be a great springboard to learning about and listening to this music. Follow my Twitter, Tumblr and Instagram for my latest photos, news and posts. Please subscribe to Kind of Pink and Purple by email (top right of the page) and also follow my Google Plus and Pinterest. 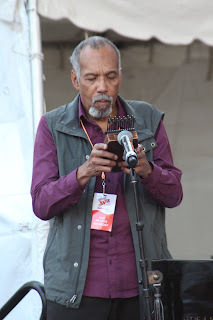 Visit my jazz poetry blog, Without a Poem and my musician website. Visit these resources to learn about veganism, a stance of nonviolence towards animals: PETA, The Best Speech You Will Ever Hear, 101 Reasons To Go Vegan, What is veganism?, Cowspiracy, The Most Inspiring Speech You Will Ever Hear. Every season has a playlist. From wintertime holiday songs to spirited summer songs, a season carries a sound. This week I wanted to share some of the albums I listened to over the course of the summer, as well as what each album helped me realize along the way. I listened to Lush Life almost everyday, on the way to work, at the gym, while reading, on car rides, etc. Singing along with Coltrane's solos in hour-long traffic and scatting along on the treadmill allowed me to start internalizing the music. This internalization not only helps me hear language, but also helps me start to realize the intention behind what I am hearing. I became aware that the trait that makes me resonate with Coltrane is honesty, and that when I learn this music I must also strive for honesty. This album, along with Lush Life, is my most listened to album of the summer. Listening anywhere I could, the repetition of hearing this album allowed me to start singing along as well. There is a temptation to always want to hear new music or more music, yet by focusing on such a small body of works, I found that I started to hear details in the performances that I wouldn't have heard before. I realized the dynamic reach of Miles Davis, and while learning these songs and solos I noticed his repetition and how he comes back to similar thoughts. This album has taught me about the importance and strength of tone: Dexter Gordon is instantly recognizable by his broad, strong sound. While learning the melody to "Days of Wine and Roses" from this album, I noticed how Dexter is not in a rush to get the next note out - everything seems so assured and natural. This element of being natural encouraged me to continue learning songs and improvising by ear. By hearing how the melody and the chords fit together, and by practicing without accompaniment, I started to realize that I should play what I am hearing, just as Dexter does, and that I don't need to overcomplicate anything. This particular album allows you to hear Monk solo, whereas many albums he is joined by a quartet. It is amazing to realize that every twist and turn in the music is solely coming from Monk himself. I particularly love how the pieces have a stride-piano influence, because it shows a bouncy, almost humorous side to Monk. This album taught me to pay justice to the melody of a song. Monk brings so much richness and depth to even cute songs like "I'm Confessin' (That I Love You)" and shows how the solos come out of the beauty of the melody, instead of trying to create beauty from nothing in the solo section. The first time I listened to this album was on a long car ride home from work. Stuck in traffic, I decided I would listen to something different, so I chose to put on Sarah Vaughan. When the track "Smoke Gets In Your Eyes" came on, I couldn't believe what I was hearing! From the sliding opening saxophone solo to the buoyancy of Sarah's vocalese, I put this one song on repeat for the entire work week, only wanting to hear this one song. Sarah's richness combined with the support of the Count Basie Orchestra is haunting. The sound of this summer was full of swing! Visit these resources for veganism: PETA, The Best Speech You Will Ever Hear, 101 Reasons To Go Vegan, What is veganism?, Cowspiracy, The Most Inspiring Speech You Will Ever Hear.